Interested in investing in telecommunications with ETFs? Since hitting 52 week lows back in March, telecom companies and telecom ETFs are making a come back as you can see in the chart below. The $630 million iShares Dow Jones U.S. Telecommunications Sector Index Fund (NYSEArca: IYZ) tracks an index of large telecom service companies such as AT&T (NYSE: T), Verizon (NYSE: VZ) and Sprint Nextel (NYSE: S). IYZ has a dividend yield of 2.7% and an expense ratio of 0.48. For more information, see the iShares website. Vanguard’s Telecommunication Services ETF (Amex: VOX) tracks a similar index and has the same top 3 holdings. VOX has a dividend yield of 3.2% and an expense ratio of 0.23. For more information, see Vanguard’s website. The PowerShares FTSE RAFI Telecommunications & Technology Sector Portfolio Fund (Nasdaq: PRFQ) tracks an index the largest U.S. telecommunications and technology equities. The Index weights stocks based on fundamental measures including book value, cash flow, sales and dividends. Top holdings include Microsoft (Nasdaq: MSFT), Verizon and AT&T. The fund has a dividend yield of 1% and an expense ratio of 0.74. For more, see the PowerShares website. The PowerShares Telecommunications & Wireless Portfolio Fund (Amex: PTE) tracks an index that uses a rules-based weighting system that looks at growth, valuation, investment timeliness and risk factors to pick stocks with the greatest capital appreciation potential. 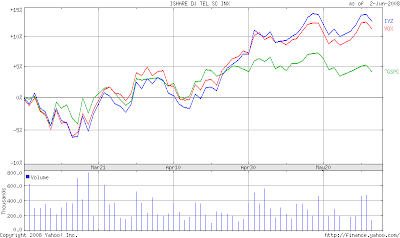 Top holdings include DISH Network (Nasdaq: DISH), Comcast (Nasdaq: CMCSA) and DirectTV (Nasdaq: DTV). The fund’s dividend yield is 3% and expense ratio is 0.66. For more, see the PowerShares website. On the international front, iShares offers the S&P Global Telecommunications Sector Index Fund (NYSEArca: IXP). The fund tracks an index of 46 global telecom service companies with 71% of the portfolio outside of the U.S. Top holdings include AT&T, Vodafone (NYSE: VOD) and Telefonica (NYSE: TEF). For more information, see the iShares website. The fundamentally weighted WisdomTree International Communications Sector Fund (NYSEArca: DGG) includes Vodafone, Telefonica and China Mobile (NYSE: CHL) in its portfolio. The fund’s dividend yield is 2.6% and expense ratio is 0.58. For more, see WisdomTree’s website.